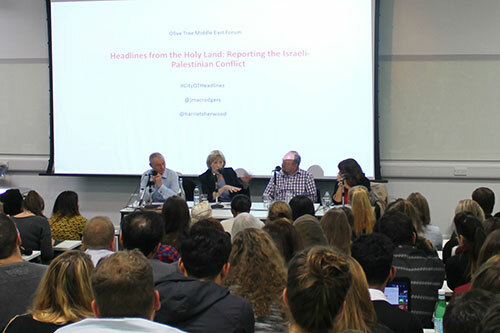 A panel of experts, including a former British diplomat and a journalist from the Guardian, discussed the challenges of reporting the Israeli-Palestinian conflict at a recent City event. The discussion marked the launch of a new book, Headlines from the Holy Land: Reporting the Israeli-Palestinian Conflict, by Dr James Rodgers, a Senior Lecturer in the Department of Journalism. The talk was jointly hosted by the department and the City-based Olive Tree Programme, which gives Palestinian and Israeli undergraduates the chance to study the issues in the region. 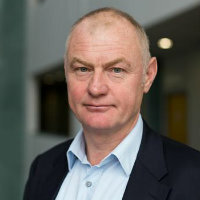 Dr Rodgers, who was the BBC’s Gaza correspondent between 2002 and 2004, explained that both sides used “spin” and a “deliberate policy to mislead” in attempts to control what was being reported by the media, and that these methods are becoming “ever more refined”. Addressing a packed audience, the academic explained that journalists were able to get a unique perspective on developments in the region. He said: “If you try to cross into the West Bank, you’ll see a very large sign in English, Arabic and Hebrew saying ‘no Israelis beyond this point’ and it’s very difficult, of course, for anyone to leave the Palestinian territory, particularly at the moment. Dr Rodgers added that the personal struggles of individuals affected by the conflict were not “adequately addressed” by diplomacy or the 2003 roadmap to peace. However, he admitted it was also not easy for journalists to report on deeper issues because of the concise nature of news broadcasts. Following Dr Rodgers’ presentation, Harriet Sherwood described her experience as the Guardian’s Jerusalem correspondent. The journalist agreed that it was difficult to understand the truth about events and the behaviour of the opposing sides because they often gave “two competing narratives”. Harriet stressed the importance of carefully considering each word that was reported, because of the meanings they may carry for each side and the varying ways they could be perceived. The journalist added that the Palestinians were “pretty hopeless at spin” while the Israeli PR operation was “an extraordinary thing to behold”. Harriet also spoke about the need for reporters to get out on the ground themselves to truly understand the story they were reporting, while balancing this with an appreciation of the benefits of social media for monitoring developments. However, she highlighted the fact that content on social media can be unreliable. Harriet explained that the internet, while having the power to spread stories to global audiences, had created an “added pressure” because of the extra scrutiny this brought. The final panel member, Sir Vincent Fean, a former British Consul-General in Jerusalem, said he believed that journalists and diplomats “complement each other”. He added that he often used the media to follow events and explained that reporters could go to places that he could not and speak to both sides in the conflict. The former diplomat also described the relative freedom that reporters have when speaking with people in the region. Sir Vincent said he believed a two-state solution was the only way to resolve the conflict and that the USA was “indispensable” for achieving this, but the country needed help from the rest of the international community. The chair of the panel was Professor Rosemary Hollis, Director of the Olive Tree Programme and an academic in the Department of International Politics at City.